Why are Intersection Crashes so Dangerous? The truth is, many of these collisions are preventable. 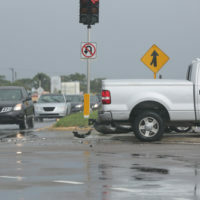 Unbelievably, roughly four in ten collisions in this country occur in intersections., making intersection accidents the second largest category of traffic accidents, following only rear-end collisions. When drivers put safety and common sense behind their rush to get places, everyone’s welfare is at risk. In intersections, it can be particularly hazardous for a number of reasons, which is why intersections claim half of all serious collisions in this country, and one-fifth of all fatal collisions. What makes intersections so perilous? Oftentimes broadside collisions cause vehicles to be bumped out of their lanes and into other vehicles, guardrails, or poles. Pedestrians frequent intersections and are at higher risk of injury. Avoid entering the intersection if it is backed up: you don’t want to be stuck there if the light changes and you cannot move forward. If someone else’s poor decisions behind the wheel have resulted in personal injury to you or a loved one, the experienced legal team at the Law Offices of Robert W. Elton can help. Contact our offices in Daytona & Ormond Beach for a free, confidential consultation.